Hi guys! 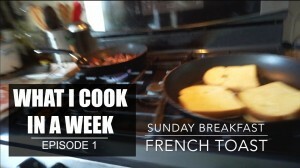 Excited to share the first episode in my new series, What I Cook In A Week. Many of you have commented on my weekly vlogs about sharing more of what I cook, so I thought this would be the easiest way to share simple ideas on what to cook and rotate for meal ideas. I normally keep a list of ideas on my phone and categorize them by protein types (chicken, beef, pork, fish) So I choose the majority of what I cook for the week based off of what is already in my fridge so nothing goes to waste, then if I need additional items I make a quick run to the store at the beginning of the week. If you want a recipe video on anything, comment below and I’ll do my best to film it the next time I make it for the fam! Thumbs up if you want more videos like this and don’t forget to subscribe!! !